If you’ve found this page, chances are you have some questions about tree care. This is a good thing—you should get your questions answered and your worries resolved before starting—and we hope that this blog will nudge you closer to some of those answers because the last thing we want is an inexperienced, unsure person doing dangerous tree maintenance work. Practicing DIY tree care can be a great thing. It can teach you about your trees, keep them healthy, get you outdoors, and save you a little money. However, it can also be extremely dangerous and counterproductive if you’re not sure what you’re doing. If you are on the fence about whether to call a tree service professional or to do the job yourself, we hope that you will keep the potential risks in mind and ensure that you are confident in your abilities before beginning anything. If after doing this you find you need some help, don’t hesitate to call Tri County Tree Services. We are Jackson, Mississippi’s go-to tree care service! 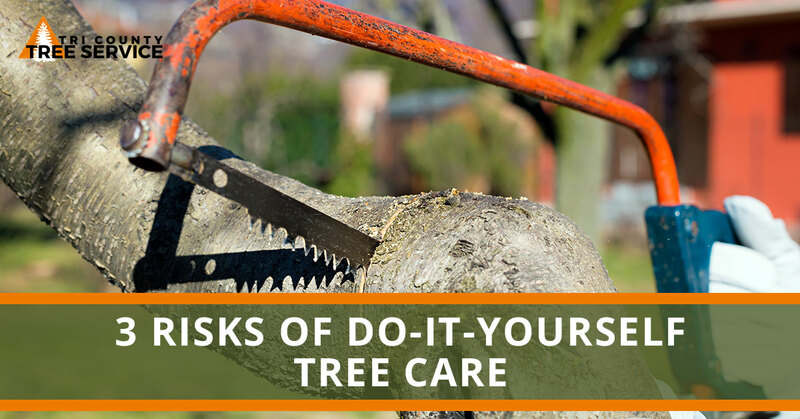 Read on to learn about some of the risks of DIY tree care. We’ve all seen the YouTube videos of amateur lumberjacks attempting to cut down a big tree in their lawn, only to have it fall in the opposite direction, crashing down on the home. If you have no experience with tree services, we highly recommend you leave it up to the tree removal professionals. The stakes are too high to go it alone. If you want to learn how to service a tree, call us and we’d be glad to let you watch our process and walk you through the steps. Additionally, a lot of tree work—especially on mature trees—requires not just a comfort with, but also a confidence with heights. A good rule of thumb is that if the job involves climbing and extreme heights call a professional. Experienced tree care specialists spend a lot of time dealing with heights, and they can safely and skillfully complete the job. Compared to the first reason this may not seem like such a drastic risk. However, it’s important to remember that untrained do-it-yourselfers can easily and unknowingly harm a tree. When pruning and trimming your trees, for example, it’s important to do your homework or to call a professional, because improper pruning can fatally damage a tree. Similarly, trimming limbs away from a massive, unwieldy section can create a weight-distribution imbalance that can put you and your tree in danger. Be sure to study up or consult with a professional before servicing your tree. Like any other big job, tree maintenance—especially tree trimming and tree removal—require professional equipment. Dull chainsaws, wobbly ladders, and a lack of proper climbing equipment can all cause damaging and even life-threatening accidents. If you don’t have the appropriate tools for a job, don’t attempt the job! In short, when it comes to caring for and maintaining your trees, there are some jobs that can be easily completed with a little homework and safety precautions. However, some jobs are best left to the professionals. Even if you think you know what you’re doing, do remember that there are many factors to be taken into consideration when doing something dangerous, like removing a limb or a tree. One miscalculation or wrong move can threaten the life of the person performing the care as well as anyone and anything else nearby. Even if you find yourself in an emergency situation where you need a tree removed, keep in mind Tri County Tree Service offers 24-hour emergency tree removal service. Remember never put yourself at risk! Call Tri County Tree Service, your local tree care provider!